It’s George H.W. Bush, a k a 41. No one would make a better U.N. ambassador for Bush 43 than Bush 41. Friedman's second choice is “42” -- Bill Clinton (who is apparently available since this opportunity didn’t pan out). In 1990-91, in the context of a radically different international order, the world averted its gaze as Syria destroyed the last vestiges of Lebanon's independence. That was the price willingly paid by President George H.W. Bush for enlisting Damascus in the first campaign against Saddam. Those were good wages garnered by the Syrians. Syria did little for the coalition but was accepted as the gendarmerie of a volatile Lebanese polity. Then the outside world forgot about Lebanon. . . But more than a decade later, U.S. power positioned itself in Iraq, directly on Syria's eastern border. . . [N]o one in Damascus could be certain that the U.S. drive to finish off Arab dictators would come to a halt in Iraq. And there were Washington's "neocons" -- a veritable obsession of the Arab intellectual and political class, in Damascus and beyond. Who knew what they had in mind? . . .
Gone, too, made obsolete by the rise of George W. Bush and Israeli Prime Minister Ariel Sharon, was the tortured U.S. diplomacy, that fabled "peace process," that had courted Damascus and catered to its sense of importance as a big player in the Fertile Crescent. . .
[F]ifteen years earlier, George H.W. Bush and Hafiz al-Assad had struck a deal that liquidated Lebanon's independence; now their sons were bringing that deal to an end. . . .
Bush 43 is virtually the exact opposite of Bush 41 -- not just with respect to specific issues such as Iraq, Lebanon, Syria, and Arafat, but also with respect to the whole “vision” thing in foreign policy (and, on the domestic side, with respect to taxes). Bush 41 is thus the last person a serious Bush 43 would send to the U.N. (it would be cute though). The last thing the U.S. needs at the U.N. is a person unable to articulate a new (which is actually the old) vision for the U.N. -- and unlikely to confront France, Russia and Kofi Annan (“wouldn’t be prudent”). The UNCHR is a cesspool of anti-Semitism -- of which Israel is, of course, the primary focus. Anne Bayefsky's April 2004 National Review column provides a good summary of the UNCHR's business last year: "Business as usual." Business as usual at the 60th session of the UNCHR included the adoption of five resolutions condemning Israel and the carving of three hours out of the UNCHR schedule to mourn the death of Hamas terrorist leader Sheikh Ahmad Yassin. Boschwitz was born in Berlin in 1930. When Hitler was made chancellor of Germany in January 1933, Boschwitz's father immediately declared that the family would leave the country. They emigrated from Germany and made their way to the United States two-and-a-half years later. Relatives who stayed behind perished in the Holocaust. . .
Boschwitz has been an ardent advocate of Jewish causes and of America's alliance with Israel before, during, and since his tenure in the Senate. In 1991 President George H.W. Bush sent Boschwitz as the American emissary to Ethiopia in a mission which resulted in Operation Solomon, the rescue and dramatic airlift of the small black Jewish community in Ethiopia to Israel. John Bolton is a blunt guy. Sometimes people say I'm a little too blunt. . . It seemed like to me it made sense to put somebody who's capable, smart, served our country for 20 years, been confirmed by the United States Senate four times and who isn't afraid to speak his mind in the post of the ambassador to the U.N.
See, the U.N. needs reform. If you're interested in reforming the U.N. like I'm interested in reforming the U.N., it makes sense to put somebody who's skilled and who's not afraid to speak his mind at the United Nations. . .
And I think it makes sense to have somebody representing the United States who will -- who will be straightforward about the issues. In 1975, the U.N. General Assembly adopted Resolution 3379, which branded "Zionism" as a form of "racism." For an overwhelming majority of Americans, this resolution represented such a fundamental repudiation of the U.N.'s basic principles that U.S. withdrawal became a viable alternative to being subject to endless, repetitive unthinking abuse. Indeed, it took 16 years until, after much effort, the Bush administration in 1991 was able to obtain repeal of the repulsive language of Resolution 3379 in 1991. In recent years, the “endless, repetitive unthinking abuse” of both the United States and Israel at the U.N. has reached a new high. With Boschwitz and Bolton (if he is confirmed) as the U.S. representatives at the U.N., there is a chance for change, like the change John Bolton helped achieve in 1991. If the New York Times foreign affairs columnist were more serious, and less cute, he would see that. Traveling today from New York to Portland, via Dallas, I was seated on the plane next to a soldier. She was dressed in fatigues, which I was surprised to realize were light brown, with irregular dark brown oval sections (so the uniform would blend in with sand) -- as opposed to the green fatigues (to blend in with jungle) I remember from the Vietnam era. She was returning from Iraq to her home in Washington, for 15 days of R&R, after five months in Iraq. She told me she was finishing up 28 hours on planes making her way home. She slept most of the way -- tired, she said, by the trip, not by the last five months. Thanked for what she had done, she shrugged it off. Thanked again, she still declined any credit. We’re doing our job. “One day at a time,” she answered. Bernard Lewis writes on “Freedom and Justice in the Modern Middle East” in the May/June 2005 issue of Foreign Affairs. In 1940, the government of France surrendered to Nazi Germany. A new collaborationist government was formed and established in a watering place called Vichy, and General Charles de Gaulle moved to London and set up a Free French committee. The French empire was beyond the reach of the Germans at that point, and the governors of the French colonies and dependencies were free to decide: they could stay with Vichy or rally to de Gaulle. Vichy was the choice of most of them, and in particular the rulers of the French-mandated territory of Syria-Lebanon, in the heart of the Arab East. This meant that Syria-Lebanon was wide open to the Nazis, who moved in and made it the main base of their propaganda and activity in the Arab world. It was at that time that the ideological foundations of what later became the Baath Party were laid, with the adaptation of Nazi ideas and methods to the Middle Eastern situation. This was a party not in the Western sense of an organization built to win elections and votes. It was a party in the Nazi and Communist sense, part of the government apparatus particularly concerned with indoctrination, surveillance, and repression. The Baath Party in Syria and the separate Baath Party in Iraq continued to function along these lines. Since 1940 and again after the arrival of the Soviets, the Middle East has basically imported European models of rule: fascist, Nazi, and communist. The type of regime that was maintained by Saddam Hussein -- and that continues to be maintained by some other rulers in the Muslim world -- is modern, indeed recent, and very alien to the foundations of Islamic civilization. There are older rules and traditions on which the peoples of the Middle East can build. [T]he Iraqi election may prove a turning point in Middle Eastern history no less important than the arrival of General Bonaparte and the French Revolution in Egypt more than two centuries ago. . .
At the present time there are two fears concerning the possibility of establishing a democracy in Iraq. One is the fear that it will not work, a fear expressed by many in the United States and one that is almost a dogma in Europe; the other fear, much more urgent in ruling circles in the Middle East, is that it will work. Clearly, a genuinely free society in Iraq would constitute a mortal threat to many of the governments of the region, including both Washington's enemies and some of those seen as Washington's allies. The end of World War II opened the way for democracy in the former Axis powers. The end of the Cold War brought a measure of freedom and a movement toward democracy in much of the former Soviet domains. With steadfastness and patience, it may now be possible at last to bring both justice and freedom to the long-tormented peoples of the Middle East. While some are consumed with exit strategies or arguments about why the U.S. went in, a broad historical story is playing out -- beginning with the defeat of fascism, then the defeat of communism, and now the current fight against an Arab totalitarianism that grew from the earlier European models. Placed in that historical context, what has happened over the last two years is stunning. History has not ended, but viewed with a wider lens, it may have a direction. We should always sit down at the table with the question of redemption in our thoughts and our hearts, for we always live in an unredeemed world. Suffering should never be invisible to us, or hunger, or grief. . . .
Walker Percy called it the search. Or at least his alter ego in “The Moviegoer” did. . . .
“What is the nature of the search, you ask. The search is what anyone would undertake if he were not sunk in the everydayness of his own life. . . . To become aware of the possibility of the search is to be onto something.” . . . If Abraham did not send Hagar and Ishmael into the desert, but we imagined it; if we had not been slaves but imagined it; if we had not been 600,000 strong at Sinai, but imagined it; if God did not let us cross into the land until a generation had died in the wilderness, but we imagined it; if David did not have Uriah killed so he could marry Bathsheba, but we imagined it; if we imagined the need for a land to create a light for the world . . . if all the contradiction and paradox were not dictated on Sinai in 40 days, but heard by us over those thousand years, and our errors written down and not denied or blamed on someone else -- then the book is all the miracle anyone should ask for, and to read it as literal is idolatry. If you need a Haggadah, you might print out Rachel Barenblat’s: she’s created one that blends traditional and nontraditional, old and new, liberal and conservative, and some passages from the Women's Seder Sourcebook, and she makes it available for free -- her Passover gift to us. It’s right here in printable form (you can thank her with a comment here). So pharaonic oppression, deliverance, Sinai, and Canaan are still with us, powerful memories shaping our perceptions of the political world. . . . We still believe, or many of us do, what the Exodus first taught, or what it has commonly been taken to teach, about the meaning and possibility of politics . . .
--- and third, that “the way to the land is through the wilderness.” There is no way to get from here to there except by joining together and marching. L'Chaim. Chag Sameach. Happy Passover. David McCullough’s magnificent speech on “American History and America’s Future,” delivered February 15, 2005 at a Hillsdale College National Leadership Seminar (quoted below by permission from IMPRIMIS, Hillsdale’s national speech digest) is worth reading in its entirety (hat tip: Scott Johnson). I’m extracting a couple of themes here because they hold some lessons for our Passover Seders on Saturday and Sunday. The laws we live by, the freedoms we enjoy, the institutions that we take for granted -- as we should never take for granted -- are all the work of other people who went before us. And to be indifferent to that isn’t just to be ignorant, it’s to be rude. . . [I]t’s something that others struggled for, strived for, often suffered for, often were defeated for and died for, for us, for the next generation. . . .
George Washington, when he took command of the continental army at Cambridge in 1775, was 43 years old, and he was the oldest of [the Founders]. Jefferson was 33 when he wrote the Declaration of Independence. John Adams was 40. Benjamin Rush -- one of the most interesting of them all and one of the founders of the antislavery movement in Philadelphia -- was 30 years old when he signed the Declaration. They were young people. . . They had no money, no navy, no real army. There wasn’t a bank in the entire country. There wasn’t but one bridge between New York and Boston. It was . . . a little fringe of settlement along the east coast. What a story. What a noble beginning. And think of this: almost no nations in the world know when they were born. We know exactly when we began and why we began and who did it. In the rotunda of the Capitol in Washington hangs John Trumbull’s great painting, “The Declaration of Independence, Fourth of July, 1776.” It’s been seen by more people than any other American painting. It’s our best known scene from our past. And almost nothing about it is accurate. The Declaration of Independence wasn’t signed on July 4th. They didn’t start to sign the Declaration until August 2nd, and only a part of the Congress was then present. They kept coming back in the months that followed from their distant states to take their turn signing the document. The chairs are wrong, the doors are in the wrong place, there were no heavy draperies at the windows, and the display of military flags and banners on the back wall is strictly a figment of Trumbull’s imagination. But what is accurate about it are the faces. Every single one of the 47 men in that painting is an identifiable, and thus accountable, individual. . . . And that’s what Trumbull wanted. He wanted us to know them and, by God, not to forget them. [W]e have to know who we were if we’re to know who we are and where we’re headed. This is essential. We have to value what our forebears -- and not just in the 18th century, but our own parents and grandparents -- did for us, or we’re not going to take it very seriously, and it can slip away. If you don’t care about it -- if you’ve inherited some great work of art that is worth a fortune and you don’t know that it’s worth a fortune, you don’t even know that it’s a great work of art and you’re not interested in it -- you’re going to lose it. . .
And there’s no secret to teaching history or to making history interesting. Barbara Tuchman said it in two words, “Tell stories.” That’s what history is: a story. Perhaps the analogy to Passover and Jewish history is obvious. It is a story -- our story -- of a people that revolted against impossible odds, spent decades in a wilderness, built a country, survived the destruction of sacred buildings and territory, preserved a Book, never gave up, never gave in, recovered from a Holocaust, never forgot (lest their right hand wither) -- and in a few days will celebrate a holiday thousands of years old in historically unparalleled freedom and comfort. And -- to borrow McCullough’s words -- we know exactly when we began and why we began and Who did it. We don’t know all the details, and some of the details we know may be wrong -- but what a story, what an inheritance. It is worth a fortune. [A]fter the war was over, Abigail [Adams] went to Europe to be with her husband, particularly when he became our first minister to the court of Saint James. And John Quincy came home from Europe to prepare for Harvard. And he had not been home in Massachusetts very long when Abigail received a letter from her sister saying that John Quincy was a very impressive young man -- and of course everybody was quite astonished that he could speak French -- but that, alas, he seemed a little overly enamored with himself and with his own opinions and that this was not going over very well in town. If you are conscious to yourself that you possess more knowledge upon some subjects than others of your standing, reflect that you have had greater opportunities of seeing the world and obtaining knowledge of mankind than any of your contemporaries. That you have never wanted a book, but it has been supplied to you. That your whole time has been spent in the company of men of literature and science. How unpardonable would it have been in you to have turned out a blockhead. Leon Wieseltier has called the current generation of Jews the “spoiled brats of Jewish history.” We have been given an unparalleled history and live in unparalleled times with unparalleled opportunities. The seder is a moment for us to appreciate it, to learn and re-learn from it, and to pass it on. What is it with American Jews? Not that anyone expects them to become Republicans or to rejoice that George W. Bush is in the White House. But why do so many of them revile him so? “He's the first American president to adopt the Israeli position that meaningful negotiations with the Palestinians cannot be held as long as Palestinian terror persists. “He's the first president to agree with Israel that Palestinian democratization must be an integral part of the peace process and to prove he meant it by shunning Yasser Arafat. “He's the first president to side with Israel on the question of its future borders by stating clearly that all areas of the West Bank in which Jewish settlers are heavily concentrated should be incorporated into Israel. "And needless to say," I went on, "Bush has also been the first president to order the military dismantling of an Arab dictatorship that was a strategic threat to Israel. . . . The fact is that, in regard to Israel, Mr. Bush has been the kind of president that one would once have considered an impossibility. . . The fact that the Christian right in America descends from the one branch of Christianity that has historically been not anti- but philo-Semitic, that of the dissenting English Protestant sects of the post-Reformation and of the American Puritanism that grew out of them, is lost on America's Jews. If it weren't, they would understand that George W. Bush has been so pro-Israel not in spite of who he is but because of it. 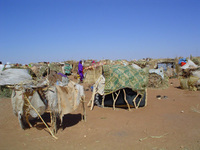 A coalition of conservative and liberal groups has formed a Coalition for Darfur blog. It is an excellent source of information. Mr. FRIST. Mr. President, as my colleagues know, I have a special interest in Sudan. I have spent much time there on an annual basis for the last several years participating in various types of work -- mission work, some medical work, as well as a Senator. . . It is clear, as I mentioned, that what is going on -- the destruction, the death, the killing -- is genocide. This body has said that. . . Since October of last year, the State Department has formally recognized the conditions in Darfur as genocide. Congress has also acted, placing sanctions on Sudan's Government and authorizing about $100 million in aid. . . In addition, last year, we in this body voted unanimously to urge the Secretary of State to take appropriate actions within the United Nations to suspend Sudan's membership on the U.N. Human Rights Commission. . . .
Every day the world fails to act, Khartoum gets closer to its genocidal goal, and every day the world fails to act, it compounds its shame. "I want you to look at me," the 19-year-old told the ambassador. "This is the future. The people that you have oppressed, the people that your government has kicked out of the country will go back. We will make the country greater than it has ever been since you have raped it since 1989." Hobbs reports that a Rwandan refugee also spoke, making an "emotional call for the world to act now . . . and discuss the international politics of it later:"
"This happened in our country in 1994 while the UN and powerful countries were discussing the word 'genocide' and whether it was a genocide, while every day 10,000 people were dying. We had the UN soldiers there, 5,000 of them. They did nothing. “Now we are discussing the word genocide. Now, when we are talking, people are dying. We know it is a genocide. You know that. Why don't you act? You discuss. Save lives, and then discuss." Mentioning the Rwandan speakers' remark that the mass killing in Rwanda and Darfur made him "ashamed to be an African," student Fabian Sborovsky said it made him "ashamed to be a human being." "While we debate, people are dying," he said. "Words are good -- action is better. All I have left of my family is memories and pictures. We should pray as if everything depends on God and act as if everything depends on us." Act as if everything depends on us. Yelena Ralph, 21, who made aliyah alone from Ukraine three years ago and currently resides in Ramat-Gan, was crowned 2005 Israel Beauty Queen last week. She came to Israel by herself at the age of 18, under the Jewish Agency's Selah program (Students before Parents), a prestigious educational program geared towards young immigrants, ages 17-20, who arrive in Israel without their parents. The program includes learning Hebrew, English, mathematics, Jewish heritage and tradition. She will now represent Israel in the 2005 Miss Universe contest on May 30 in Bangkok, Thailand. (Hat tip: Clarity & Resolve). Q: If there was ever a moment where you ever had any doubts in your own faith, what out of the past public things would strengthen your resolve and firm up your relationship with your God? THE PRESIDENT: I think a walk in faith constantly confronts doubt, as faith becomes more mature. And you constantly confront, you know, questions. My faith is strong. The Bible talks about, you've got to constantly stay in touch with the Word of God in order to help you on the walk. But the Lord works in mysterious ways, and during all our life's journeys we're enabled to see the Lord at work if our eyes are open and our hearts are open. And today -- you can analyze and you can look at the coffin being held, with the sun shining on it, anyway you want. I happen to feel it was a special moment that was part of a special ceremony for a special person. And it helped strengthen my faith. And you can have your faith strengthened on -- you can have your faith strengthened when you stand up at a faith-based initiative and see someone standing up and testify to what their love has done to help a child, or how a child's life has been helped. My faith gets strengthened when I went to the school the other day and saw the mentoring relationship between a young professional woman and a young kid who's going to go to the seed school where there's a 95 percent chance that kid is going to go to college. And that helps strengthen my faith. So there's, you know, ways -- whether the moment be majestical or whether the moment be a part of just an average -- your average moment in life, you can find ways to strengthen your faith. And it's necessary to do so, in my judgment. There is a -- it's called a "walk," it's not called a "moment" or a "respite," it's a walk. It's a constant maturing of an understanding of a -- and today's ceremony, I bet you, for millions of people was a reaffirmation for many and a way to make sure doubts don't seep into your soul. It is close to a perfect answer -- the acknowledgment of the ever-present existence of doubt, the characterization of faith as a “walk” (with echoes of the 23rd Psalm), and the recognition of evidence of transcendence in moments both large and small. Norman Lamm of Yeshiva University published a lengthy scholarly article on “Faith and Doubt” that is worth studying. But in some ways George W. Bush’s extemporaneous statement on the plane back to America -- delivered without benefit of speechwriters or a prepared text, complete with a word not found in a dictionary (“majestical”) that is nevertheless the perfect word (like “misunderestimated”) -- is better. Saul Bellow passed away this week, after a career in literature spanning 56 years -- from his first novel in 1944 (“Dangling Man”) to his last in 2000 (“Ravelstein”), written at the age of 84. He received the National Book Award three times (for “The Adventures of Augie March,” “Herzog,” and “Mr. Sammler’s Planet”), the Pulitzer Prize (for “Humboldt’s Gift”) and the Nobel Prize (for novels about characters who, in the Nobel Committee's words, keep “trying to find a foothold . . . in our tottering world . . . [based on] faith that the value of life depends on its dignity, not on its success”). [We] seem to be experiencing the anguish of new states of consciousness. In America many millions of people have in the last forty years received a "higher education" -- in many cases a dubious blessing. In the upheavals of the Sixties we felt for the first time the effects of up-to-date teachings, concepts, sensitivities, the pervasiveness of psychological, pedagogical, political ideas. Every year we see scores of books and articles which tell the Americans what a state they are in -- which make intelligent or simpleminded or extravagant or lurid or demented statements. All reflect the crises we are in while telling us what we must do about them; these analysts are produced by the very disorder and confusion they prescribe for. It is as a writer that I am considering their extreme moral sensitivity, their desire for perfection, their intolerance of the defects of society, the touching, the comical boundlessness of their demands, their anxiety, their irritability, their sensitivity, their tendermindedness, their goodness, their convulsiveness, the recklessness with which they experiment with drugs and touch-therapies and bombs. A novel moves back and forth between the world of objects, of actions, of appearances, and that other world from which these "true impressions" come and which moves us to believe that the good we hang onto so tenaciously -- in the face of evil, so obstinately -- is no illusion. No one who has spent years in the writing of novels can be unaware of this. The novel . . . is a sort of latter-day lean-to, a hovel in which the spirit takes shelter. A novel is balanced between a few true impressions and the multitude of false ones that make up most of what we call life. It tells us that for every human being there is a diversity of existences, that the single existence is itself an illusion in part, that these many existences signify something, tend to something, fulfill something; it promises us meaning, harmony and even justice. What Conrad said was true, art attempts to find in the universe, in matter as well as in the facts of life, what is fundamental, enduring, essential. [Israel] is both a garrison state and a cultivated society, both Spartan and Athenian. It tries to do everything, to make provisions for everything. All resources, all faculties are strained. Unremitting thought about the world situation parallels the defense effort. These people are actively, individually involved in universal history. I don’t see how they can bear it. a persistent intuition – not so much a hope . . . call it love impulses. What I think is how agreeable it would be to see my mother and my father and my brother again. . . . So the only thing I can think of is that in death we might become God’s apprentices and have the real secrets of the universe revealed to us. May it be a true impression for him, and for us. In the meantime, we have his words.